My clinic turned 1 this week! Can you believe it? 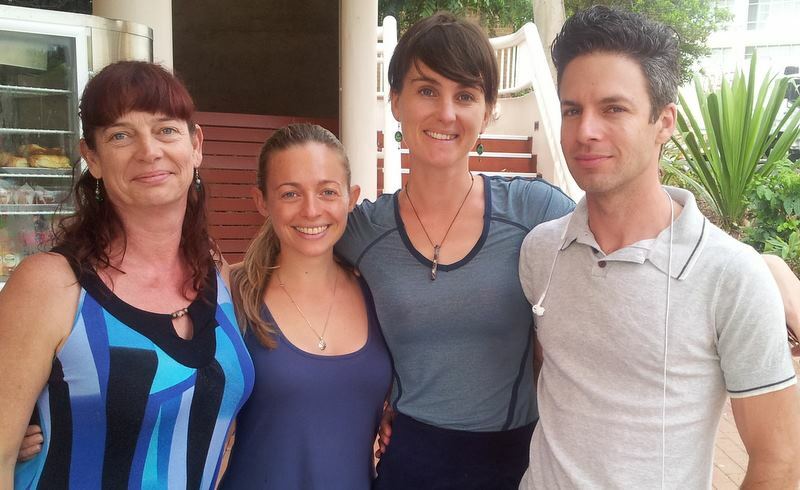 My little Broadbeach clinic, Sarah George Acupuncture & Natural Health, has celebrated her first birthday this week. It’s been a lovely year in the clinic, growing from helping just a few patients to now seeing a lovely group of people in need of holistic acupuncture and natural health care treatment for a range of women’s health, pregnancy and fertility conditions, chronic pain and illness and neurological disorders. Thank you to my patients and anyone who has referred someone to me. After working in busy, multi-room clinics for most of my career it’s nice to slow things down and provide other Chinese Medicine therapies as needed, like tuina (Chinese massage), gua sha (scraping – not as scary as it sounds), moxa and cupping (there are so many different ways of having cupping done). Next week I’ll be announcing an exciting new therapy in the clinic – stay tuned! So thank you for being a part of my clinic’s first year whether you’ve been a patient or just followed along on this blog, facebook, twitter or instagram with the idea of one day coming in for a treatment. Here’s to another great year! See you in the clinic. Call 07 5526 8632 to make an appointment. It’s been too long! I hope you’ve all been well. 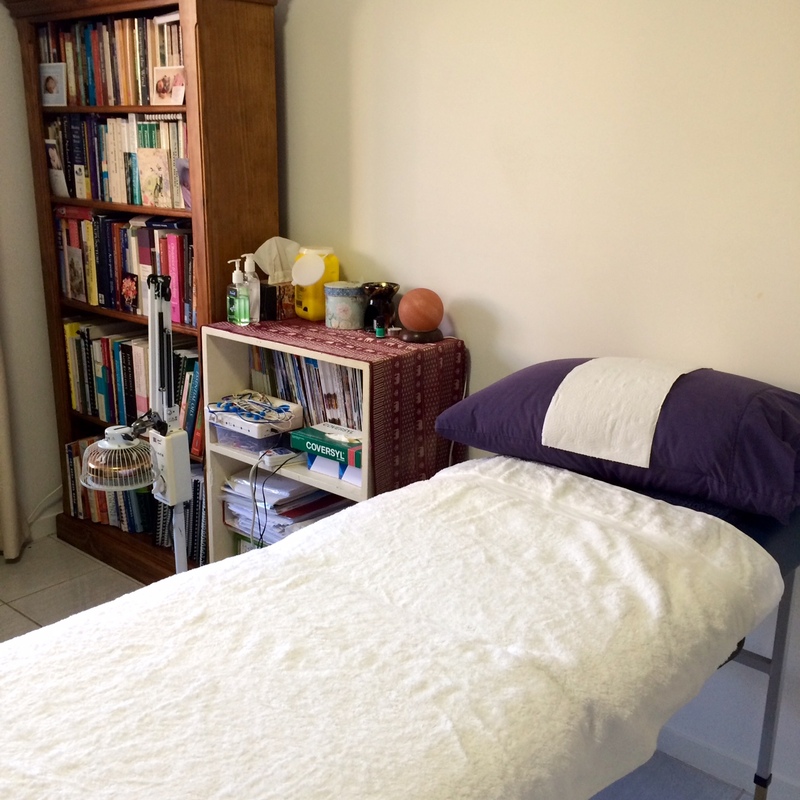 Things have been both busy and restorative since I moved from Brisbane to be the Chinese Medicine Senior Lecturer at Endeavour College of Natural Health’s Gold Coast campus. So I have good news… my new clinic is open at Broadbeach – finally! Hooray! To book, call: 07 5526 8632. My focus will continue to be on women’s health including pregnancy, fertility & IVF support, but also conditions including period pain, irregular menstrual cycles, polycystic ovarian syndrome (PCOS), endometriosis, proconception care, pre-birth treatment, menopausal symptoms, stress, anxiety, insomnia, digestive complaints, body pains and enhancing general wellbeing. 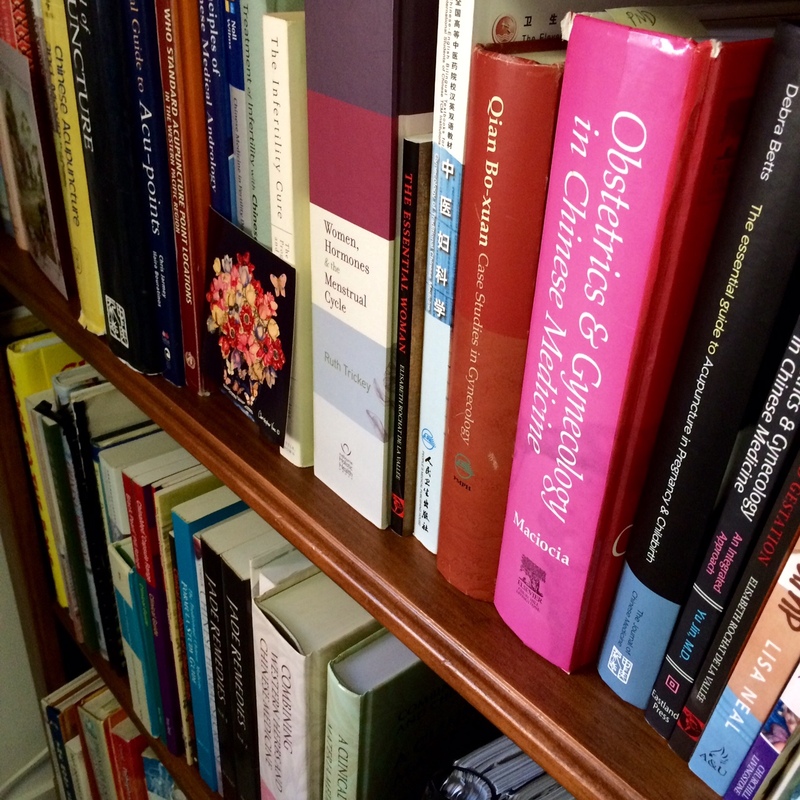 More obstetric, fertility and women’s health texts than you can poke a stick at! 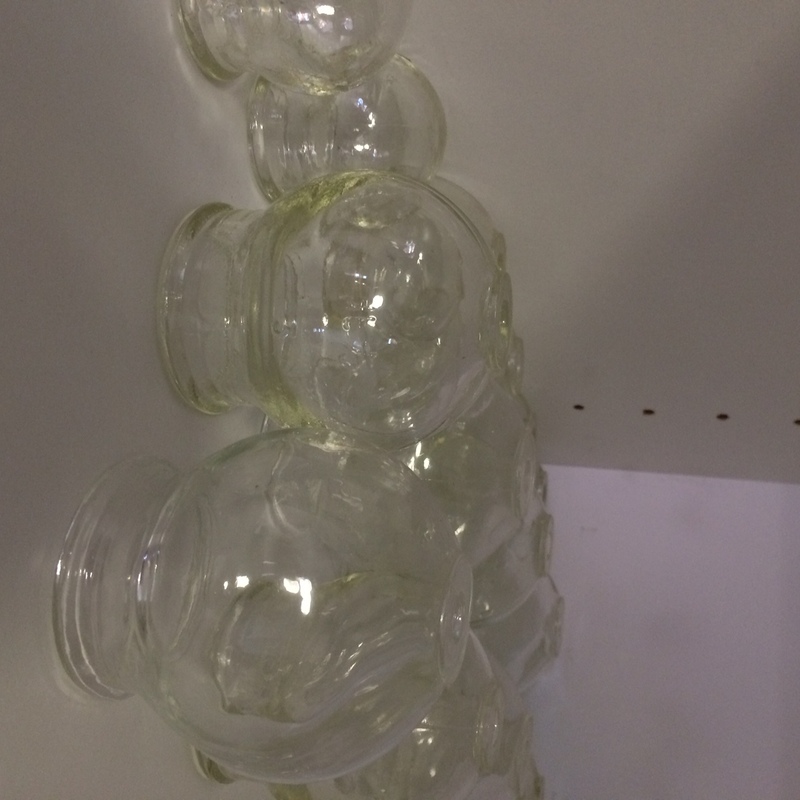 Ever had cupping? It’s great – ask me about it. There’s plenty of free parking on the street too. I’m also looking very forward to bringing you regular blog posts to help you to enhance your wellness too. I hope to see you in clinic soon! And/or feel free to share this post with people you know on the Gold Coast who need a good acupuncturist. Diagnosis and treatment are completely individualised. It doesn’t matter if you have osteoarthritis, endometriosis or Chronic Fatigue Syndrome (CFS), in Chinese medicine we are interested in your unique signs and symptoms and we may give you a Chinese medicine diagnosis which is completely different from that of another person with the same disease name but a slightly different presentation. 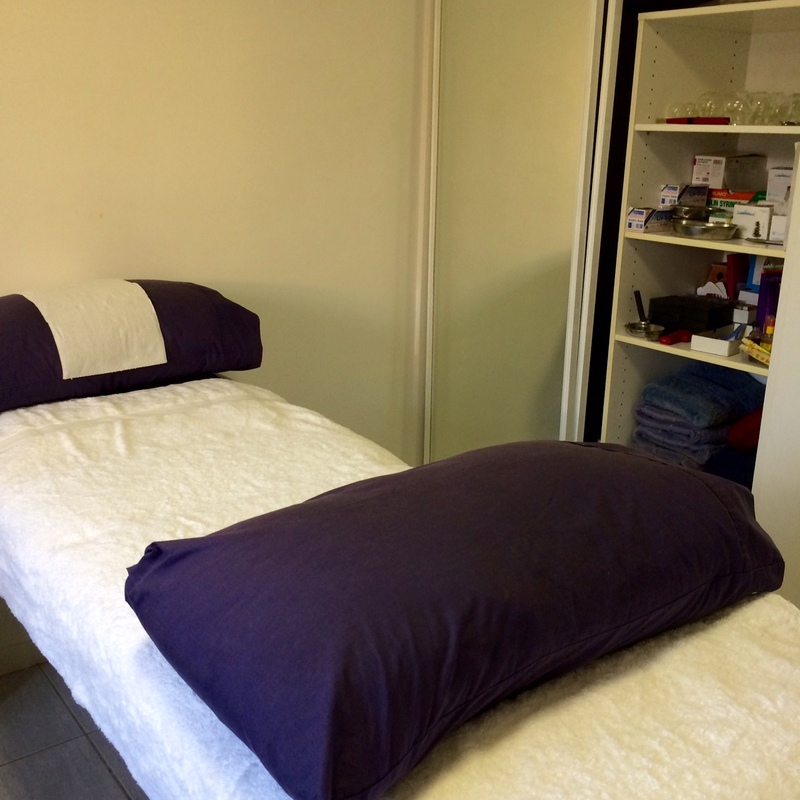 Your treatment will be individualised just for you. There are no super foods. Or good foods. Or bad foods. Or fad diets. I know that goji berries and shiitake mushrooms are seen as foods of the gods, and soy has a reputation as the fruit of the devil for every single person on the planet (according to nutrition in the media) but in Chinese medicine we just don’t see it that way. All foods have different energetic properties (eg. cooling, heating, move upwards or downwards, drain damp, nourish blood or open the pores) and so they are used to bring your body back into balance when it isn’t already. For example, if it’s hot it needs cooling and if you are carrying excess fluid you need to drain damp. Of course your body’s needs change as you age, with the season and with illness or regaining health. As this happens your diet also needs to change. It’s not black and white. 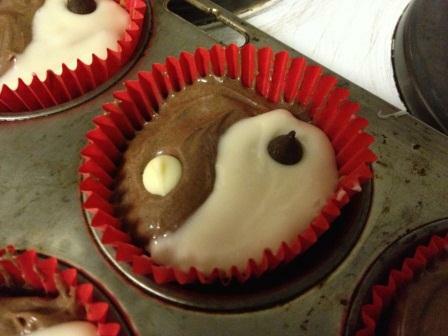 Which is exactly what the taiji (yin yang) symbol represents: there is always some black in the white and vice versa. Be sensible with your eating, strive for balance and pay attention to how foods make you feel. There is a strong connection to nature within the medicine. 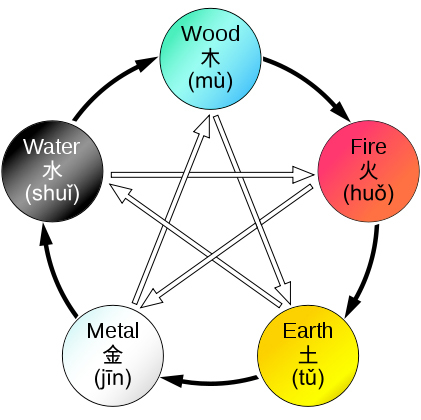 Five element theory is a way of applying the principles of nature to our bodies. It’s based on thousands of years of observation. We can describe and diagnose people’s temperaments and body conditions according to Earth, Metal, Water, Wood and Fire. Each element relies upon and is interrelated to the others to keep delicate balance. Just like nature is. For example too much Earth can make us heavy, too much water can create fluid retention and too much fire can make us overheated. It’s a more complex system them this but those are just some simple examples. It can be an outright treatment, an alternative or a complementary medicine. So we all know that acupuncture alone is sometimes great for sorting out that sore shoulder or helping you sleep better. Other times acupuncture can work very well alongside other western medicine treatment. Some conditions that spring to mind are when we use acupuncture with IVF treatment or alongside chemotherapy which may reduce some of the side effects like nausea. As acupuncture does not involve ingestion of herbs or medicines it is rarely contraindicated with other therapies. Most people feel relaxed and emotionally ‘like a weight has lifted’ immediately following an acupuncture treatment. Patients often comment that they can fall asleep during an acupuncture treatment when they can’t take afternoon naps at home. It is a relaxing treatment and believe it or not – no the needles don’t really hurt most of the time. In fact relaxation has been described as a side effect of acupuncture in this study. 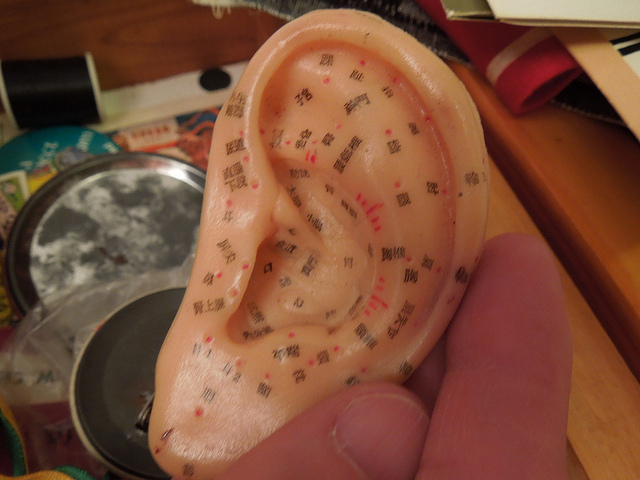 Having a knowledge of acupuncture and acupressure is like having a first aid kit with you wherever you go. Symptoms like nausea and headaches can often be relieved if you know the right spots to push. I often take some ‘ear seeds’ with me when I go camping or hiking to manage musculoskeletal pains (these little seeds apply pressure to parts of the ear that correspond to other parts of your body – like acupressure. Anyone who has used a Sea-Band on their wrist for seasickness is doing acupressure – you place the hard bit of the band onto an acupuncture point! Of course, it can’t do everything and it’s always handy to have a regular first aid kit too. Energy flow is fundamental to Chinese medicine and acupuncture. Learning good posture and effective breathing is essential not only to good health but also being a good practitioner. Think of tai chi, Qi gong, yoga and martial arts. We apply these same postural and breathing techniques when inserting needles. But really, you can apply good posture and effective breathing to everything that you do. The history of Chinese Medicine is decorated with beautiful stories, poetry and artworks to document and share the medicine. 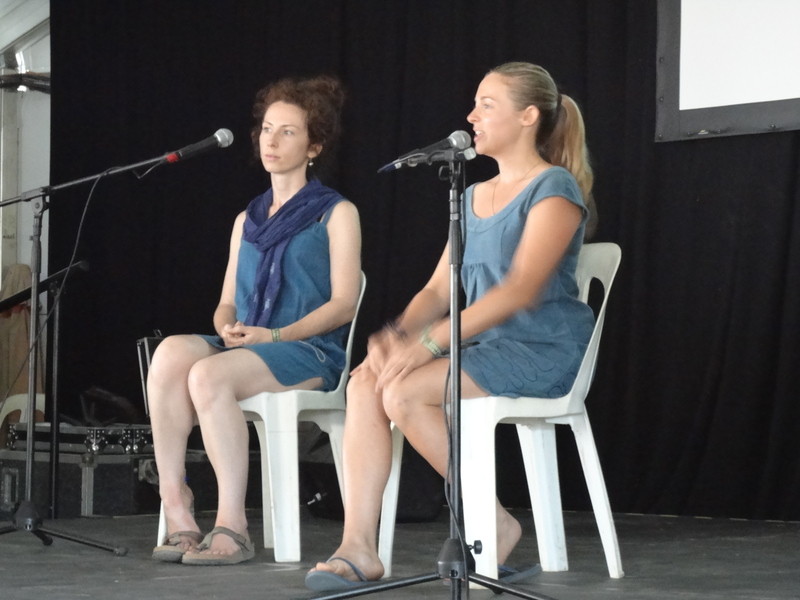 An appreciation of the arts is also considered a part of holistic healthcare. 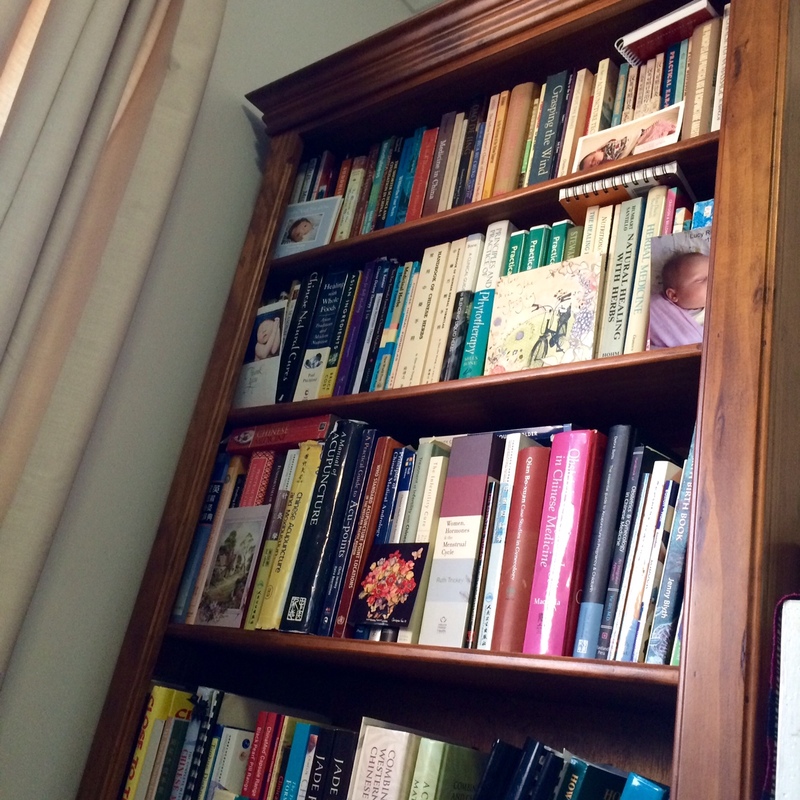 I often describe to my fertility or pregnancy patients that one of the acupuncture points is called ‘zigong’ or ‘the palace of the child’. How gorgeous is that? We can incorporate these beautiful descriptions into meditations or visualisations during treatment. Just a word of warning: nowhere here have I said Chinese medicine is a cure all. I just wanted to highlight the things that Chinese medicine does really well. For information about your own health please speak with a registered Chinese medicine practitioner. What is it that you love about acupuncture and Chinese medicine? Tell me in the comments. I’d love to know. Acupuncture pops up from 6.50 minutes into The Young Ones episode titled “Sick”. Although I can’t imagine why you wouldn’t want to watch it from the beginning because The Young Ones is so bwilliant! Watch out for the cameo from Madness too. This video demonstrates why you should only get acupuncture from an AHPRA (Chinese Medicine Registration Board) registered acupuncturist and not someone like Vyvyan, the medical student. We use fine needles inserted with a technique that has been developed over a four year bachelor degree course and beyond rather than Vyvyan’s 6 inch nails that are tapped in with a hammer.